I’m so excited about Christmas this year! Zoe is 2 years old, so I think she’ll get it this year. She was only a couple of months’ old for her first Christmas, 2 years ago – and she slept through most of it, including the very loud Mama Mia karaoke my sister had organized! And while she dressed up for the festivities last year, she didn’t understand the concept of presents or Santa Claus. But this year, we’re going to see Santa and I know she’s going to love all the presents, Christmas tree decorations, crackers, party hats etc etc. Can’t wait! 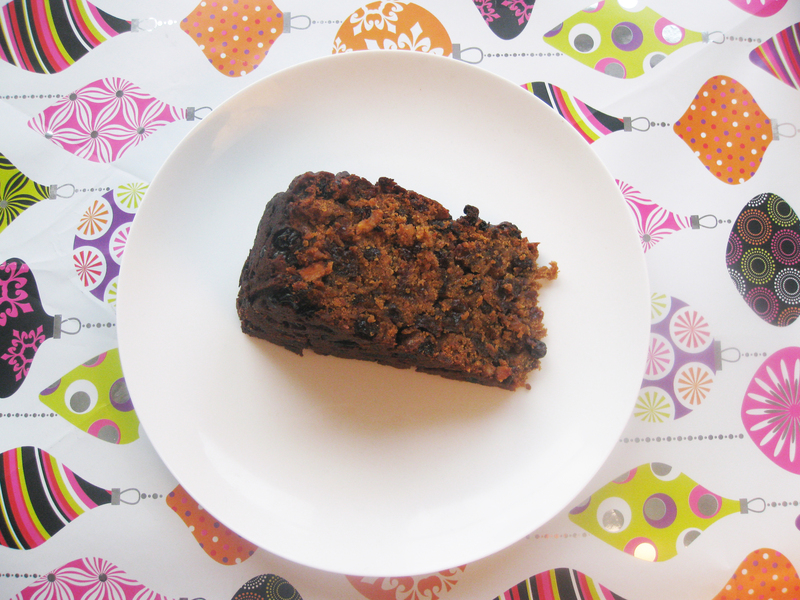 Here’s a recipe for a fantastically delicious gluten-free and dairy-free Christmas cake – very rich and moist. By all means feed it with more brandy while you wait for the day. And wrap it tightly in foil, then in an airtight container to store it. I’ve made 2 cakes here, because I wanted one for Christmas day and one to freeze (it freezes brilliantly). But you could always make 1 very large one, instead. Just cook for another hour or so, peering at it frequently to make sure you don’t overcook it. Preheat the oven to 150°C/300°F/gas 2 and lightly grease 2 x 23cm/9in springform cake tins with dairy-free margarine. Put the sultanas, raisins and currants and 1l/35fl oz/4 cups water in a saucepan. Bring to the boil over a high heat, then turn the heat down to medium and simmer for 30–40 minutes until all of the fruit has softened and the water has been absorbed. Pour the brandy in, mix thoroughly, and leave to one side. Put the almonds in a food processor and pulse until chopped. Sift the flours into a large mixing bowl and add the ground almonds, salt, gluten-free baking powder, xanthan gum and spices and mix well. Using an electric mixer, beat the dairy-free margarine and sugar together in a large mixing bowl until light and fluffy. Gradually beat in the eggs, one at a time, until well mixed, then stir in the softened fruits, chopped almonds and pineapple or mango pieces, using a spoon. Quickly fold in the flour mixture. Make sure the batter is well blended, but take care not to overmix. Pour the batter into the tins and smooth the surfaces with the back of a metal spoon. Bake for 30 minutes, then cover both tins with baking parchment, tucking the ends under the tins securely. Bake for another 1¾–2 hours until browned on top, well risen and a skewer inserted in the centre comes out clean. Leave to cool in the tins for 5 minutes, then turn out and transfer to a wire rack. Leave to cool completely before serving. Jenny from Juvela very kindly sent me some samples of the Juvela range of products (many thanks, Jenny!) and I thought the Tagliatelle was great – incredibly easy to cook, with no need to add oil or keep stirring to stop it sticking together. And it’s made from good ingredients – Maize starch, Egg, Rice Starch, Emulsifier (Mono- & Diglycerides of Fatty Acids). Bring a large saucepan of water to the boil. Add the tagliatelle and cook over a medium-high heat for 8–10 minutes, or according to the packet instructions. Meanwhile, put the peas in a steamer and steam, covered, over a high heat for 3–4 minutes until tender. Remove and set aside. In a bowl, whisk together the egg yolks, lemon juice and soya yogurt and set aside. Drain the tagliatelle and rinse well with boiling water, then drain again. Put the tagliatelle back in the saucepan and quickly stir in the egg mixture. Quickly add the peas and watercress, stir thoroughly and season with salt and pepper. 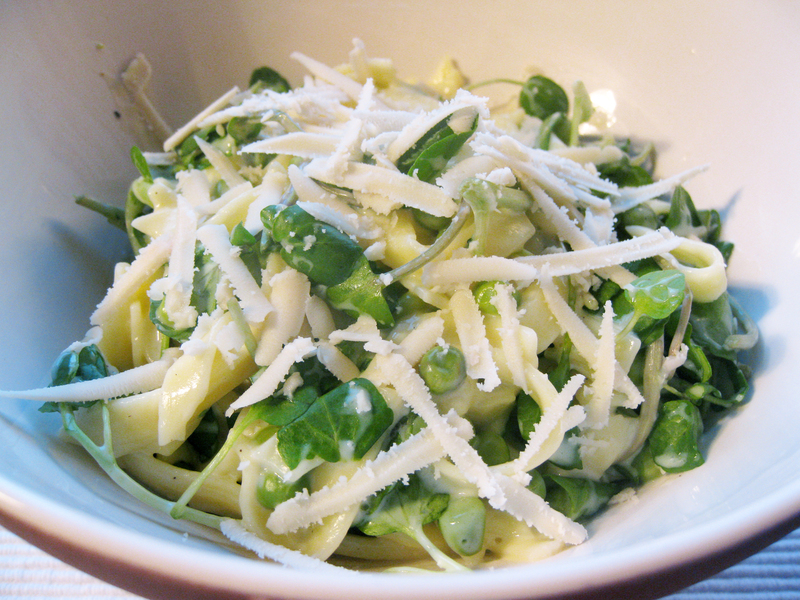 Serve immediately with the grated soya cheese sprinkled over the top. 4th and final week of my detox! Peter says my skin is glowing and I’ve now lost 3.5kg. Yippee! 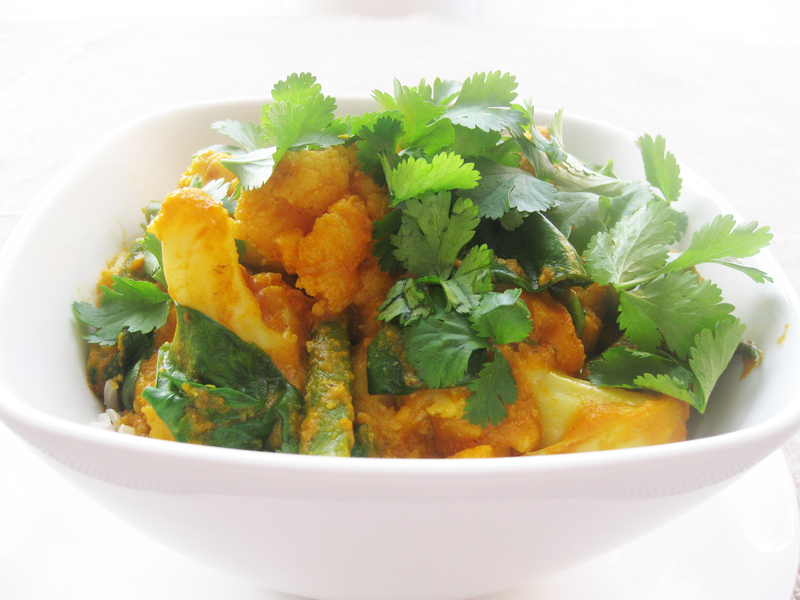 I made this vegetable curry today and wanted to share it because it’s incredibly easy, and yet delicious. Again, it’s from Max Tomlinson’s book, Clean Up Your Diet. Put the rice in a saucepan and pour in boiling water. Cook, according to the packet instructions. Put the onion and olive oil in a wok or deep frying pan and cook over a low heat for 10 minutes. Add the garlic, ginger, chilli and spices and cook gently for a further 10 minutes. Meanwhile, skin the tomatoes. Cut a cross in the top of each tomato and put in a large heatproof bowl. Pour over enough boiling water to cover and leave for 10 seconds. Remove the tomatoes from the water using a slotted spoon, and peel off the skin when they are cool enough to handle. Discard the seeds and roughly chop the tomato flesh. Add the chopped tomatoes and water to the onion mixture. Raise the heat to medium, bring up to a simmer and cook for 10 minutes. Allow to cool slightly then transfer to a liquidizer and blitz until smooth. Put the cauliflower and sauce in a saucepan over a medium heat. Bring up to a simmer, cover with a lid and cook for 10 minutes. Add the beans and cook for a further 3–4 minutes, until the beans are tender. Stir in the spinach and cook for 1 minute, until just wilted. Season with the grated nutmeg. Drain any excess water from the rice. Serve the curry on a bed of rice, with the coriander sprinkled over. 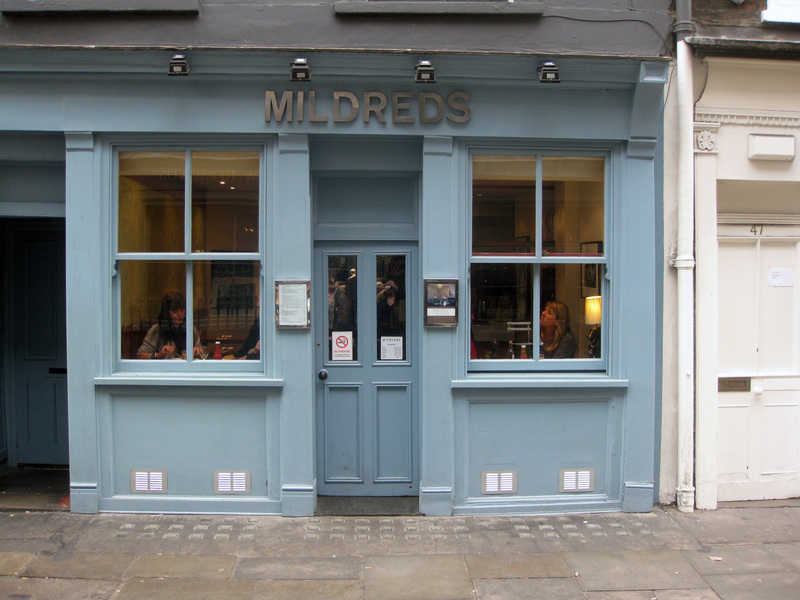 This week I went to Mildreds in Soho. I love this place – it’s a fantastic vegetarian restaurant that uses organic ingredients when possible and has a lovely range of internationally-inspired recipes. And it has a wonderful atmosphere and staff. (And they have a great blog.) 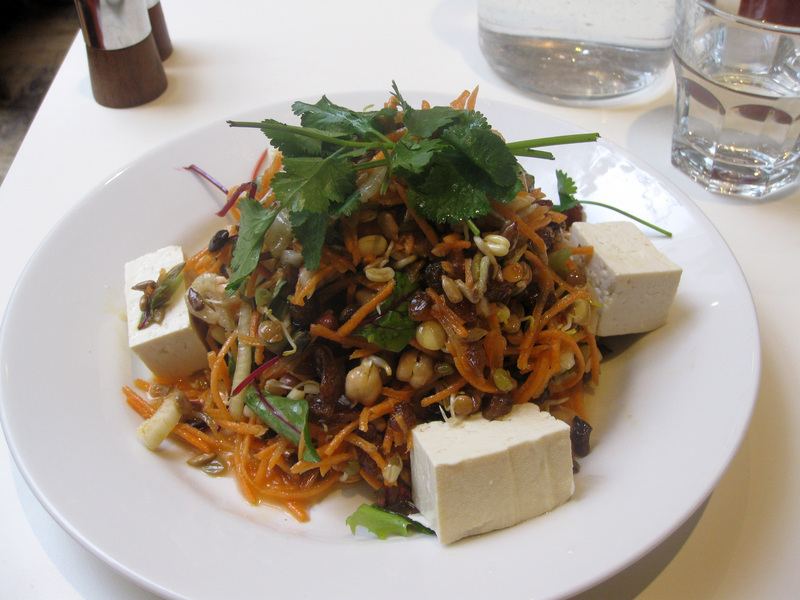 I had the Energizing Detox Salad with carrots, sultanas, fennel, sprouting beans, coriander and toasted pumpkins and sunflower seeds with an apple, lime and ginger dressing and served with organic tofu. Brilliant for my detox but also a lovely salad in its own right – the flavours were all really well judged – nothing overpowering anything else. I had expected the apple, lime and ginger dressing to be quite full-on, but instead it was subtle; giving the carrots, sultanas, fennel, sprouts, coriander and seeds the opportunity to shine. The menu shows when a recipe is gluten-free or vegan, making ordering brilliantly easy! It’s the 2nd weekend of my detox and it’s all going well! 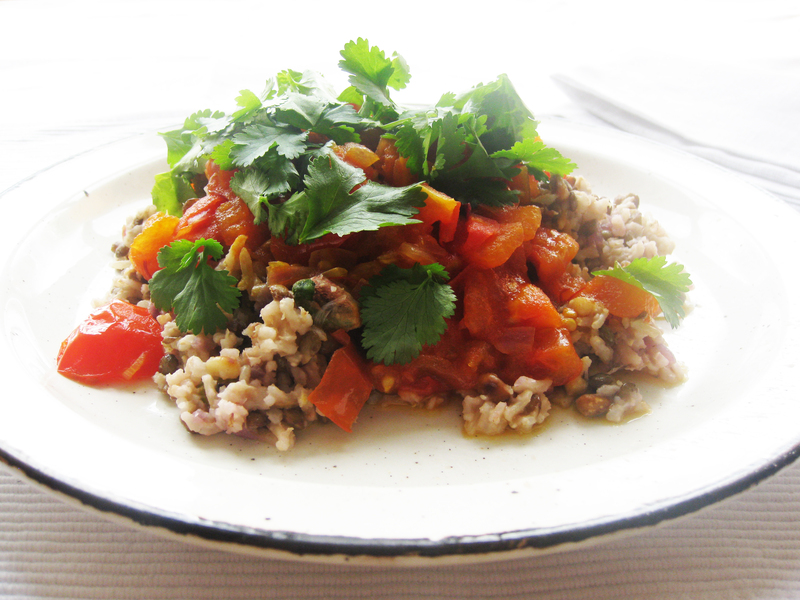 I’ve just made a lovely recipe from Max Tomlinson’s book, Clean Up Your Diet. Doing a detox is tough – there’s no getting around that. But there are so many benefits, including the fact that you find that you really appreciate the tastes, textures and aromas of foods in their pure state. And this recipe is a great example of that. I used puy lentils, and their nutty taste combines with the delicious sweet tastes from the nutmeg, pistachios, pine nuts and sweetened onions. Then there’s just enough lemon juice to give the whole dish a wonderful tanginess – and also to stop you wanting to add any salt to the dish. And all finished off with a great fresh tomato sauce and sprinklings of fresh coriander. This recipe shows how when you cook vegetables very gently, you can bring out their deep, often sweet, flavours. To caramelize the onions here, there’s no sugar – but instead you cook them gently in water first to soften them and then gently fry them. I have to admit that I didn’t bother to remove the skins and seeds from the tomatoes – completely up to you whether you want to or not. Put the rice, lentils, bay leaves and 900ml/30fl oz/scant 4 cups water in a saucepan over a medium heat. Bring to the boil, then reduce the heat slightly, cover and simmer for 40 minutes, until the rice is tender. Meanwhile, put the sliced onion, 1 tablespoon of the olive oil and 150ml/5fl oz/3⁄4 cup water in a frying pan over a medium to low heat and cook gently for 30 minutes, stirring occasionally, until the onions are soft and sweet. Increase the heat to high and boil off any excess water, then cook the onions for about 8 minutes until brown and caramelized. Watch them carefully and stir frequently to prevent them burning. While the onion and rice are cooking, skin the tomatoes. Cut a cross in the top of each tomato and put them in a large heatproof bowl. Pour over enough boiling water to cover and leave for 10 seconds. Remove the tomatoes from the water using a slotted spoon, and peel off the skin when they are cool enough to handle. Discard the seeds and roughly chop the tomato flesh. Put the chopped onion and the remaining 1 tablespoon of olive oil in a medium saucepan over a low heat and cook for 10 minutes, until softened. Add the saffron and cook for 2 minutes. Add the tomatoes, raise the heat to medium and cook for 5 minutes, until the tomatoes have softened slightly but have not collapsed. Stir in 2 teaspoons of the lemon juice. Drain the rice and remove the bay leaves. Stir in the pine nuts, pistachios, caramelized onions, nutmeg and the remaining 2 tablespoons of lemon juice. Divide the rice between two plates and spoon over the tomato sauce. Scatter over the coriander and serve.